Wall 2 Wall Commercial Flooring has provided quality services since 1989. We’re not just a flooring company, We help you meet your goals. From selection to overseeing the procurement and installation of your floor covering, our professional contract managers and field supervisors are here to help. W2W Commercial Flooring installation expertise goes way beyond just carpet and hard surface flooring. 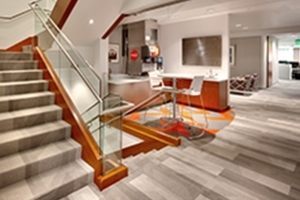 We offer a complete range of specialty floor products and services. Our clients are located far and near. Wall 2 Wall Commercial Flooring areas of expertise range from healthcare, government, corporate, sports, education, hospitality, and performing arts. Whether it is new construction or renovation, W2W Commercial Flooring installation expertise will ensure that your project is completed on-time and on budget. With extensive knowledge of all types of flooring materials and experience with large projects – W2W Commercial Flooring will help you put your best foot forward. Sport flooring is a highly technical and specialized surface. When you work with Wall 2 Wall Commercial Flooring you know our team is the winning choice. We offer a complete range of industrial and specialty floor products to cover any surface. We work with architects and designers to achieve their Leed project goals. We invite caring people to join our team, people of very high character. The rest takes care of itself! In collaboration with our Starnet network we have the ability to serve clients with projects across the nation and the globe. Family-owned and operating with decades of experience providing quality services and client satisfaction. W2W project management services ensure your project is completed on time, and on budget.